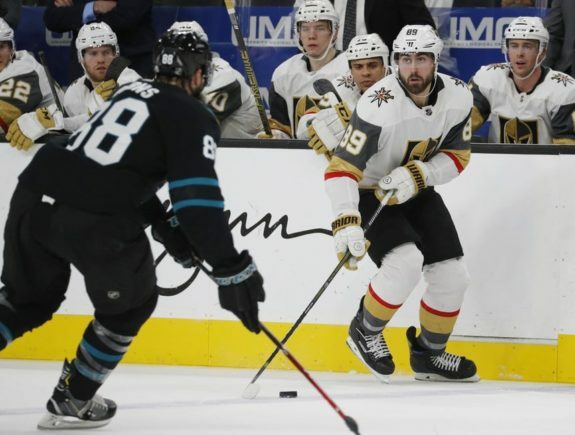 LAS VEGAS — Melker Karlsson and Joonas Donskoi scored third-period goals 39 seconds apart to lift the San Jose Sharks over the Vegas Golden Knights 3-2 on Thursday night. San Jose won its fifth straight and ended the Golden Knights’ seven-game winning streak. The Sharks (59 points) leapfrogged Vegas in the Pacific Division standings and are one point behind Calgary for the top spot. Brent Burns’ shot from the point rebounded perfectly to Karlsson, who found a wide open net to tie it 2-2. Donskoi then had the puck bounce off him amid heavy traffic in front for a 3-2 lead with 11:57 left. The Sharks earned their 1,000th victory. Vegas had the NHL’s longest active home point streak of 12 games (10-0-2) snapped. Nosek pounced on a rebound after Ryan Reaves’ shot from the circle was blocked and one-timed a squeaker between Jones’ pad and the post from the opposite circle. Hertl tied it in the second period when he grabbed a loose puck that caromed off the boards in front of the Sharks bench and got past Ryan Carpenter to beat Fleury with a wrist shot. It was San Jose’s first goal of the season against Fleury, who blanked the Sharks in a 6-0 win on Nov. 24. NOTES: The Sharks trailed after one period for just the ninth time this season. … Valentin Zykov made his Golden Knights debut after being claimed off waivers from Edmonton on Dec. 29. … Burns played in his 435th consecutive game, a streak that began Nov. 21, 2013.